Noah Diaz, junior, also known as Nodeezee, performing on the stage at lunch. He’s an aspiring rapper at Cam High. Junior Noah Diaz spent the summer of 2014 listening to popular rapper Eminem, and since then, has never been the same. Diaz is a self-taught aspiring rapper known by his stage name, Nodeezee, a mashup of his first and last names. 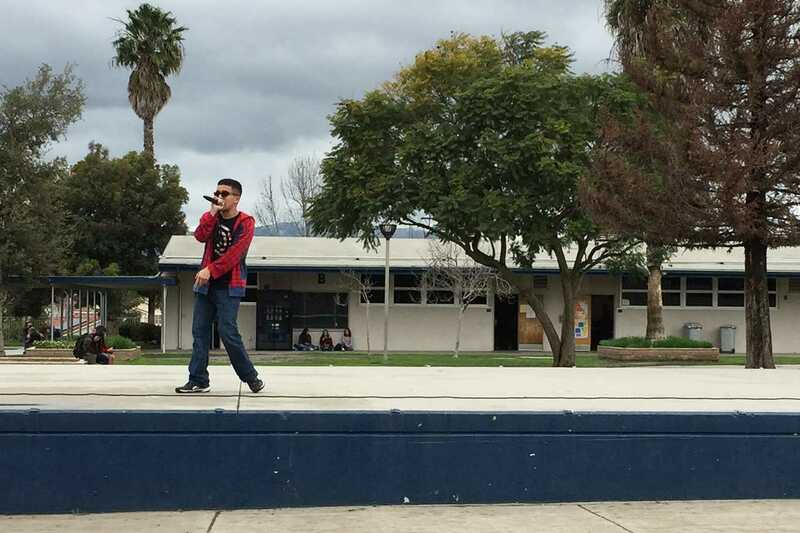 Diaz raps at lunch in the quad, and is releasing a new album soon to Soundcloud. He said that he learned his skills from YouTube videos and listening to broad varieties of rapping styles. “Lil Wayne is the one who ignited the fire to my passion, and Eminem was that barrel that just exploded it,” Diaz said. Diaz was also inspired by artists like Kendrick, Tupac, Biggie, Jay Z, and Kanye. Diaz enjoys performing both original songs and covers, as well as accepting challenges. “I’m never really nervous in front of a crowd, but when I perform my own stuff it becomes kind of difficult,” he said. “Basically, it’s like a big soundtrack to a movie where it’s an evolving story throughout the lyrics,” said Diaz. The completion of his album was postponed temporarily, because Diaz starred in the Lion King at the Ventura Performing Theater for Young Arts. Diaz played Mufasa and older Simba in the play and was excited to perform the weekend of Dec. 10. Diaz hopes to perform more at school in the future, as soon as he finishes his new album.